The sleek design of the Beltone First™ is nearly invisible. Control your hearing aids, modify sound, and stream wirelessly from your smartphone discreetly. Beltone First™ hearing aids give you new ways to hear the sounds you love. With Made for iPhone capability, Beltone First™ hearing aids receive clear, clean sound streamed from your iPhone, iPad® and iPod Touch®…like tiny wireless headphones. Beltone First™ hearing aids wirelessly communicate with each other to customize sound as your surroundings change. By prioritizing speech, it’s easy to hear the conversation, even in noisy places. Enjoy seamless transitions as you move from quiet to loud environments. Best of all: it’s all hands-free. Pick up the phone, listen to music, watch a movie and get the sound directly through your hearing aids. If you want an award-winning hearing aid that has a nearly invisible design and offers clean, clear sound with seamless integration and control from your smartphone, then Beltone First™ is your best bet. Beltone First™ hearing aids are the best ergonomically designed hearing aids on the market today. You can use the Beltone First™ slim hearing aids to hear any conversation, even in the noisiest environment. 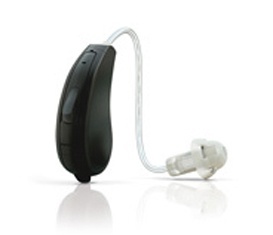 The best way to experience the unique power of this hearing aid is to pay a visit to the nearest Beltone hearing aid center and let our audiologist help you customize it to meet your needs. Ready for a better quality of life? Take the next step and visit the nearest Beltone hearing aid store today. We’ll examine your hearing and customize a Beltone First™ hearing aid just for you.